Read below about another author who will be in town at the end of the month for the AFCC. Please contact her if you'd like to arrange a visit -- or meet her at AFCC. 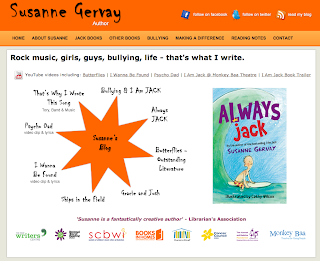 I am an Australian author, Susanne Gervay, who will be in Singapore to speak at Asian festival of Children's Literature 26-29th May. I am an award winning picture book, children's and YA author, and have spoken at festivals and conferences throughout the world including keynotes from Delhi, New York, Bologna Book Fair, UBUD, throughout Australia and many places. I spoke a few years ago at the Beijing Literature Festival where I spoke at international schools there and also in Hong Kong. My 'I AM JACK' is a rite-of-passage anti school bullying book used throughout Australia, endorsed by Room to Read, Life Education Australia, The Madeline and Alannah Foundation and Australian schools. It has been released in the USA with my other JACK books following. It is translated into Korean, Slovenian, Bahasa and under negotiations with Taiwan. My background is an educational consultant as well as an author. I speak frequently to all age groups and to parents and teachers about anti school bullying. Story and emotional engagement with characters is one of the effective ways of engendering cultural change and empowering young people to work towards a safer world. I AM JACK has been adapted into an acclaimed play by Monkey Baa Theatre (www.monkeybaa.com.au) and has had four seasons in Australian theatres across Victoria, NSW and Queensland. It will be doing a 3 month theatrical tour of USA theatres in 2014. Currently my JACK books are in preproduction as a feature film which uses humour, life, the ups and down. Driven by the narrative of anti-bullying on a personal and international stage, it also includes strong sub themes of inclusion, family, Vietnam refugees, gaining grandparents, cancer and love. I will be booking my flights soon, but could stay on in Singapore Friday 31st May, 3 and 4th June. Otherwise it'd be great to make contact as I travel quite a lot speaking internationally and Singapore is a great stop over.